Urban gardens provide access to fruits and vegetables in neighborhoods where poorly stocked corner stores and fast food outlets are plentiful and sources of fresh, local produce are few and far between. They promote healthful eating and contribute to public health improvements in communities struggling with high rates of obesity and nutrition-related chronic disease, and increase food security by providing inner city residents with sources of affordable, locally grown and controlled food. But urban gardens grow much more than food: they also cultivate community and help advance racial and economic justice in historically disinvested neighborhoods. To witness the many benefits of urban gardens in action, one need look no further than the Milwaukee Urban Gardens (MUG) program. Founded in 2000 by a group of inner-city residents who lost their gardening space to developers, MUG advocates for the long-term protection of community gardens and neighborhood green space in urban Milwaukee. As a land trust, MUG acquires vacant or derelict City-owned properties to preserve them from development and transform them into community gardens. In 2013, MUG merged with Groundwork Milwaukee, which now operates the program. What began with just five gardens in 2000 has evolved into a trusted name in urban agriculture in Milwaukee, leasing over 90 vacant lots on behalf of community groups across the city. MUG builds partnerships around local food production and food security and provides leadership, education, policy analysis, and project development support for the City of Milwaukee’s thriving community-based food system. improving residentsʼ overall quality of life. 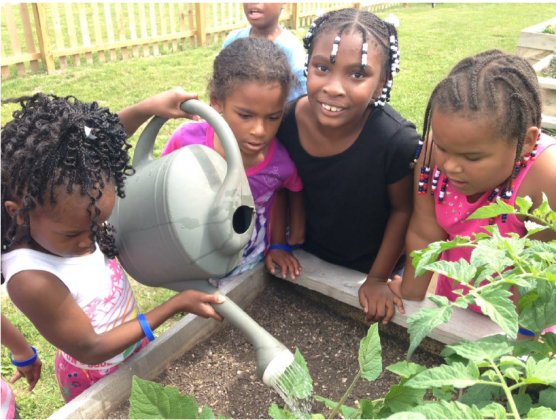 MUG gardens also provide myriad youth development opportunities for Groundwork Milwaukee. Each growing season, Groundwork Milwaukee’s Green Team helps to build rainwater harvesting structures in MUG gardens and help with garden management. Through Groundwork Milwaukee’s Young Farmers program, interested Community Supported Agriculture (CSA) member farmers in the community mentor local high school students and immerse them in the agricultural, community, and fiscal responsibilities it takes to run a successful urban farm. 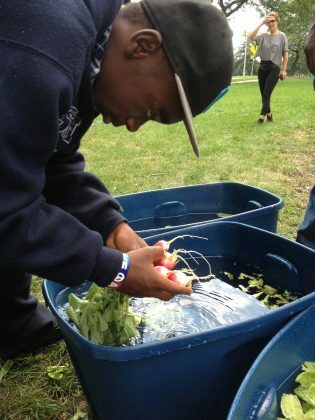 Over the course of four years, the teens learn how to grow and maintain a garden, gain entrepreneurial and customer communication skills, and build confidence. They also learn to invest in their own health as they receive weekly CSA shares of produce they’ve helped grow. Groundwork Milwaukee’s Junior Young Farmers Program offers elementary and middle-school aged youth an opportunity to learn gardening skills by planting, maintaining and harvesting over a dozen community garden vegetable beds in Milwaukee’s Metcalfe Park neighborhood. 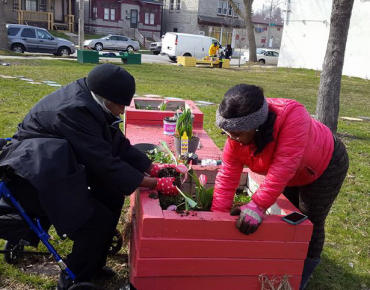 To draw attention to the tireless work of residents to improve their neighborhoods by creating, maintaining, and growing community gardens, Groundwork Milwaukee launched a Strong Roots awards program in 2015. The program honors the accomplishments of MUG gardens and their leaders in several categories — including best approach to stormwater management, best community involvement, most creative use of space, and best harvest — and recognizes them as models for encouraging other community gardens to reach their full potential.